The trade you'll make by choosing a hybrid over a smartwatch is you'll get less functionality as there's no display, but what if you could do more with a traditional looking timepiece? That's the idea behind the new Citizen Eco-Drive Riiiver (yes, that's its real name) that looks like your average watch but comes with access to a variety of other features called iiideas (again, its real name). These actions work in a similar way to If This Then That (IFTTT) where you can set up functionality that happens when you press the button at the top of the right hand edge of the watch. Citizen has given a variety of examples of what you can set up, and one includes pressing the top button to call a taxi. Once you've pressed the button, an app on your phone will be able to do all the hard work (we assume this would work with services like Uber and Lyft) and you'll be notified of what time the taxi will arrive with the hands showing it on the watch face. Another example given here is to press the top button to find the nearest cafe. The hands will then spin to the direction you need to travel, and you'll be able to follow them without getting your phone out of your pocket. Other functionality could include turning on your lights at home or setting up other smart home features that can work with a click of a button on your hybrid. This functionality will only work for some people who regularly do the same activity though. The good news if you can set up your own iiideas within the app, or download others from Citizen's own Riiiver store. The Citizen Eco-Drive Riiiver comes in four different designs, but each is fundamentally the same with three functionality buttons sitting on the right hand edge of the watch. Only the top button will work for the iiideas actions. The Eco-Drive Riiiver will track your steps, and it's water resistant but we don't currently know whether it'll include swim tracking tech. The release date for the watch is set as "Fall 2019" in the US, which means you won't be able to buy this watch until at least September this year. It's also set to cost $420 (about £315, AU$600), and we've yet to discover whether you'll be able to buy it in the UK or Australia. 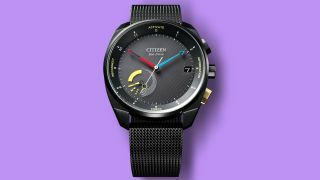 We'll be sure to update this story in the future when we hear more details about the release of Citizen's upcoming hybrid range.